Chicago police said they found a loaded handgun lying in the grass along Recreation Drive near the car where two gangbangers were hanging out late Friday night. But prosecutors refused to file weapons charges in the case because the gun couldn't be tested for fingerprints on the weekend, police said. Instead, Alfonso Fierro and two friends are charged with being on park property after hours and other minor offenses. Fierro, known as “Little A,” is currently awaiting trial for allegedly possessing a loaded handgun in a car this winter. And one of his other arrestees is a felony gun offender. Around 11:50 p.m. on Friday, 19th District (Town Hall) cops were enforcing the curfew along the 3600 block of North Recreation Drive, a known gang hangout that has been the site of several shootings. The officers came upon a car where 27-year-old Fierro, 20-year-old Angel Gontarz, and a 17-year-old female juvenile were hanging out, according to police. A police spokesman said that upon seeing police blue lights, Fierro ran from the scene and was taken into custody after a short foot pursuit. Fierro was “holding his side” as he ran, according to an officer’s report, possibly indicating that he had a firearm in his waistband. A search of the path taken during the foot chase revealed a loaded handgun lying about 30 feet in front of the trio’s car, according to police. The gun had a defaced serial number. In January, police said Fierro was seen with a loaded handgun in a car near Gage Park. Fierro, with his hands cuffed behind his back, allegedly ran from the scene, but did not get far before being tackled by police. 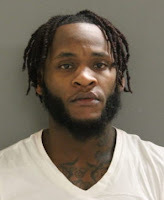 He’s currently facing charges of Class X felony armed violence, eight felony firearms charges, and manufacture-delivery of cocaine in the case. He was released on recognizance bond by Judge Sophia Atcherson and is due back in court on April 30. He previously served prison time twice for manufacture-delivery of cannabis, according to court records. Gontarz was convicted in 2015 of carrying a loaded handgun in a shopping bag in the McKinley Park neighborhood. He was charged with eight felony weapons counts and pleaded guilty to one gun charge and guilty to escaping from electronic monitoring while awaiting trial. Since being released, he has twice been charged with having street gang contact while on parole and been charged with failure to register as a gun offender. All of those cases were thrown out. In the lakefront incident, Fierro was charged with being on park district property after hours and released on a $120 cash bond. Gontarz was charged with being on park district property after hours and a new count of failure to register as a gun offender. He was also released on a $120 cash bond. The juvenile was charged with being on parkland after hours and obstructing identification. No further information is available about her case. Aziz Muhammad, who was profiled in our February 1st gun report, has skipped out on his “affordable bail” and gone missing, according to court records. Muhammad, 28, is accused of having a 14-inch sawed-off shotgun in a gym bag in a car on the South Side in late January. Judge Stephanie Miller allowed him to go free on a recognizance bond. Records show he failed to appear in court on Monday. An arrest warrant has been issued. Miller, who was a torchbearer for the affordable bail movement, lost her election campaign last month. Original reporting that you’ll see nowhere else. Donate $49 or more to our operating fund and you’ll receive a year’s worth of exclusive reports and services. Monthly plans from just $5 available.